Sitting in traffic may appear to be a good time to pick up the iPad and do some browsing, for fun and work. But, it isn’t really a good idea to take your eyes off the road even when at a stand still on the road in traffic. Luckily, the iPad can now help you not get in those traffic jams in the first place. 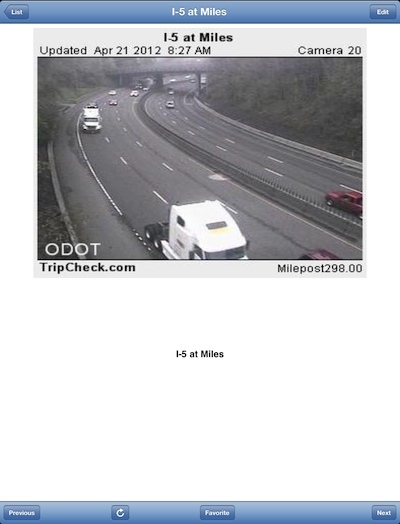 Before you head out, take a quick look at the traffic cams on the path you will be taking to see if things are moving along or stop-n-go. The ability has been on the iPhone for year, not the MultiCam app has gone universal. Buy a license and you can use the capability on both your iPad and iPhone at no extra charge. Actually for charges, there is no ongoing cam or subscription charges, just the cost of the app in the start. It is also handy if the news reports something in an area to see for yourself without the need to wait for the next news update. MultiCam covers 56 cities from around the world. Well, two of those ‘cities’ are actually water Ferries and one city Dallas has been removed at the request of the City Officials. 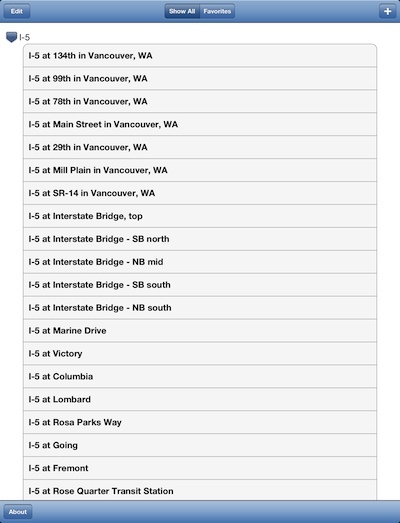 Launching the app, you have a long list of available cams broken down by major roadways. You can swipe up/down to scroll through the options, tap one to be taken to the street cam at that location. No, you don’t get to take control of the cam and turn or zoom, that would be cool though wouldn’t it?! When viewing a individual cam, you can change to the next/previous cam by using the buttons by the same name at the bottom of the MultiCam screen. To remove the need of going through every camera on a particular road, add individual cams to the Favorite area to get access to just the cams you need. All cams are still available via the front page.